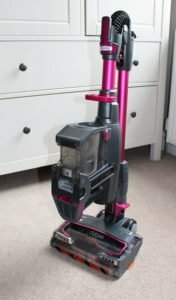 A few months I wrote an article on my search for a new cordless vacuum cleaner. At the time I was considering the Dyson V8 Absolute versus the Shark DuoClean and in the end, decided to purchase the Shark. The model we got was actually the TruePet version (model number IF200UKT) and this was cheaper than the standard version at the time. The main difference between the two models is the inclusion of a motorised pet tool (a mini cleaning head attachment) and a different coloured tube (the TruePet is a lively metallic fuchsia colour compared to blue on the standard model). It’s also worth mentioning that both models are available in twin battery version and these include a charging docking unit. At the time though I didn’t feel it was necessary (and worth the extra cost) of buying one of these versions. 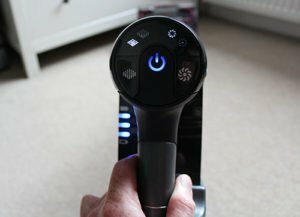 The main reason for choosing the Shark vacuum cleaner over the Dyson at the time was that I felt the “Shark offered better features that I needed (such as the removable battery charging) and is also more competitively priced”. So far, I have not been disappointed. The “Flexology” feature is a key selling point of the Shark. 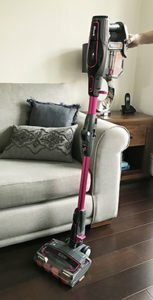 Basically, it’s got a pivot in the middle of the tube, called a Flexology reach (check) as this enables you to reach under items of furniture and also allows you to fold the vacuum in half for storage. We’ve not used the Flexology feature much when cleaning as it’s a bit more difficult to control the vacuum and you can get under most furniture by just lowering the handheld unit and pivoting the cleaning head. It does come in very handy though for folding the vacuum in half for storage. The cleaning head pivots and has a fair amount of movement. It does go under freestanding drawers and cupboards but struggles under our bed and sofa (the height of the cleaning head is just under 7 cm). As with a lot of cordless stick vacuum cleaners you cannot actually leave the vacuum upright (the weight at the top of the unit just tips it over), so you have to lay on the floor or on furniture if you are pausing between cleaning jobs. The cleaning head allows you to clean quite close against the skirting board but this has meant that we have scuffed the side of the cleaning head. There are 2 sets of bright LED lights on the front of the cleaning head. I thought that these would be a bit of a gimmick, but they are actually quite useful for seeing under furniture or when using in a dimly lit room. The Shark has two settings, one for hard floor and one for carpets, and these are changed on the control panel at the back of the handheld unit. There is also a high speed clean that provides more suction. The power, floor setting and speed buttons are all easily accessible when holding the vacuum. The battery itself has three power level indicators that can easily be seen when operating the vacuum. The cleaning head has two plastic wheels with hard rubber treads and so far, I’ve not seen it mark our wooden floors, but it does make a lot of noise when moving across the wooden floorboards. The cleaning head itself has two rotating brush bars (DuoClean) and some extra felt protection for hard floors. One of my concerns when researching cordless vacuum cleaners was damage to our wooden floors, but so far, the Shark has been great (we always use on the hard floor setting for the wooden floors). When used in carpet mode the two rotating brush bars spin faster, this does mean it pulls away from you and is harder to pull back (as you are working against the spinning rollers) but nothing too excessive. The carpet setting will also use more battery power than the hard floor mode. The dirt container on the Shark isn’t one of the largest available but it does not fill it that quickly and is easy to empty. This is done but placing the handheld unit over a bi and pressing a button on the unit to release a flap on the container so you don’t need to get your hands dirty. With the flap open you can also access the filter compartment and remove any stuck items (I’ve mainly found that hair gets caught around this filter). 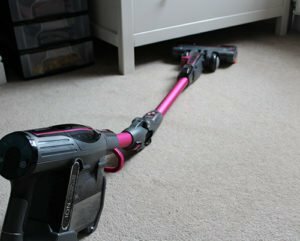 The total quoted weight of the Shark is 4.0kg, which is the heaviest of the 6 bestselling cordless vacuum cleaners we reviewed, the Dyson V7 Total Clean only weighs 2.2kg! I don’t think this weight disadvantage is noticeable and if anything, it gives the vacuum a sturdy quality feel. There are 2 filters on the unit that need to be washed every month. These are easily removed from the top and bottom of the handheld unit. You can then wash them and leave overnight to dry. The brush heads can also be cleaned easily (mainly for removing hair) by taking the covers off and cutting along a channel in the brush bar. We’ve had this vacuum for about 5 months now and it’s starting to get a few battle scars. The side of the cleaning head is paint scuffed due to going up tight against skirting boards, the Shark badge on the cleaning head is also scuffed from going under low furniture and the battery has lost some of its silver print due to removal/replacement in the handheld unit. The Shark comes with plenty of useful attachments and its supplied with a handy tote bag for storage, although on Dyson models the tools are actually neatly stores on the docking station. As ours is a TruePet model it comes with a motorised mini cleaning head. Like the main cleaning head, the (small) brush bar rotates and it can also be used on high speed setting (the floor settings are disabled when this tool is connected). This tools also has a button that folds the attachment for storage but I’m not exactly sure what space saving this gives you and we’ve never had to use it. We don’t actually have a pet, but I find this tool really useful for cleaning the stair treads as well as the car seats and carpets. The reason we decided to go for the TruePet model though was at the time it was cheaper than the standard model! A useful feature on the Shark (although to be honest I’ve not used it like this yet), is the fact that the main cleaning head can be attached directly to the handheld unit (so no long tube). The idea is that this makes it easier to clean stairs, but I find that its too large and bulky for our stair treads and the mini motorised cleaning head is actually easier to use. The different parts of the vacuum are easily attached by pushing buttons or leavers. For storage, you press the button in the middle of the tube and the wand can then be folded in half. It locks in place in this position and it also has a carrying handle so moving and storing is quite easy. A good feature on the Shark (and one of the reasons for choosing) was the fact that the battery can be removed from the unit and charged anywhere and doesn’t need to be plugged into a fixed docking station. The quoted charge time for the battery is 3.5 hours. I’ve never timed it, but this feels about right. This is a fairly short charge time for a cordless vacuum and compares with the same 3.5 hours for the Dyson V7. Something that caught me out when I was first charging was that the blue charging light would flash. This is basically a safety feature to prevent you from charging the battery when it’s still hot after use. In terms of run time, the quoted figure is 22 minutes, but I think you actually get longer than this. It’s just enough to clean our 3 bedroom house but you have to be quick. 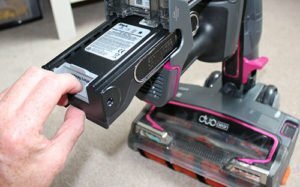 If you are going for more of an intense clean, or if you have a larger house, then you are going to have to charge the battery part way through cleaning. I guess this is where the additional battery comes in handy, although it does cost around £70. The battery is also easily accessible in the folded position and is removed by pressing a button and then slotted back in place. We like: Great for different floor surfaces. Good suction. Reasonably lightweight. Useful tools especially motorised mini cleaning head. Easy to store and charge. Lengthy 5 year warranty. Not so good: Not much to be honest. The runtime could be longer than the 22 minutes. Has suffered some scuffs on some of the parts but I think this is mainly our fault. 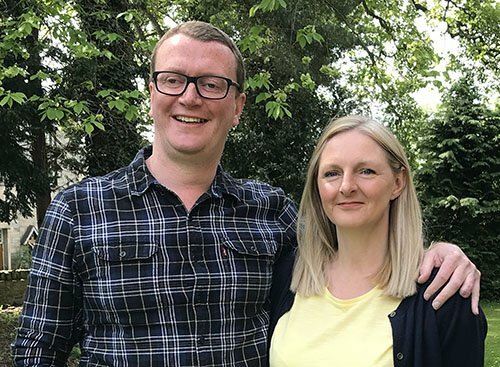 Our verdict: Very happy with this vacuum and a great, quality alternative to a Dyson.